It all started about 20 years ago when my husband (Reid) and I bought our first Mazur painting. We met at a pub below his studio right near the BGSU campus. 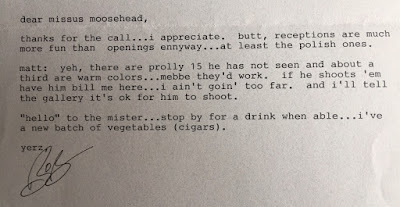 As we sat in the booth to order beverages, Bob pointed at Reid and asked ‘Moosehead?’ as in the beer, and Reid responded ‘Moosehead???? Well, you’re not so good looking yourself’! 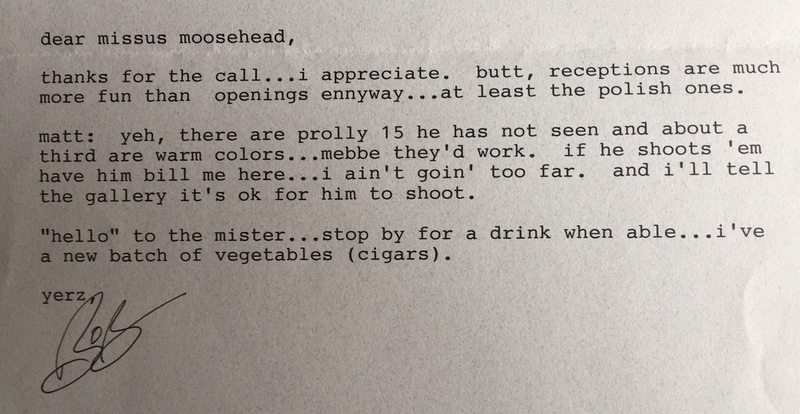 From that point on Bob fondly referred to us as ‘Mr. & Mrs. Moosehead’ and a close friendship was born. My memories of Bob date way back to my childhood. In the late 60’s my parents opened the first modern art gallery in Toledo called The Ron Mickel Gallery, where they helped launch the careers of many notable artists in our area, and one of their favorites was Bob Mazur . At the time he was into intestines (of all things). His paintings were more like sculpture – 3 dimensional very powerful and abstract pieces depicting colorful ‘innards’. Over the years he moved away from that subject, into landscapes and eventually dove deep into the water, literally. Inspired by a love of deep sea diving, he spent his later years focusing on this them with his ‘Night Swim’ series, and those are the paintings with which he really made his mark as a very fine artist. 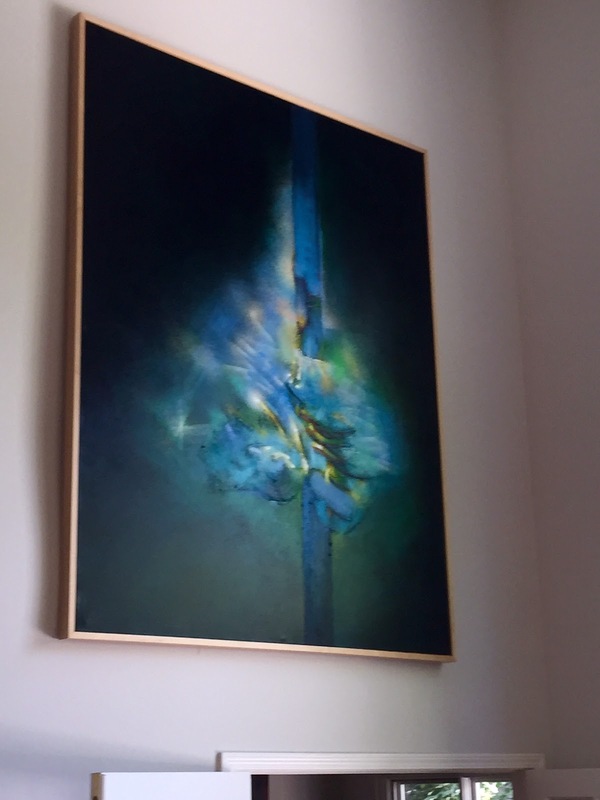 My family has collected his work over the years and now many of his paintings live our home; three of which that we purchased, and two that were passed on to us by our mothers. Here I present two views of this incredible painting, one which shows the detail, color and the light and the other, where I attempt to channel Sally Mann, showing the un-styled view I take in every morning when I stretch to start my day. As I got to know Bob, we decided to do a little work together. My brother started photographing his work for reproduction and he opened an online art gallery on our website. 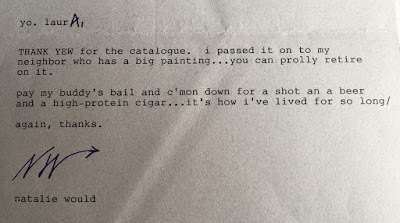 For awhile we had some success with selling his work on Target.com and because I think he had a lot of confidence in me, Bob asked me to represent him to galleries in our area. Unfortunately, I had to decline simply because I was swamped with my other priorities here at American Frame AND I was in the thick of raising teenagers at home. I just couldn’t take it on. I have to say it’s a big regret. I often think about how much fun it would have been. But we do what we can. Rarely in life do we get second chances and I am humbled to say that with his passing, I have received a new opportunity to do what he had asked of me just a few short years ago. To honor Bob and his legacy, both as a highly respected Professor of Art and very important artist in his own right, I have been asked by Lynne Mazur and the leadership at the BGSU School of Art to help sell Bob’s remaining paintings: 20 to be exact, for the benefit of the BGSU Foundation, a scholarship fund for art students. The work will be auctioned at his Celebration of Life, scheduled for May 14, 2016 at BGSU. Details to follow. 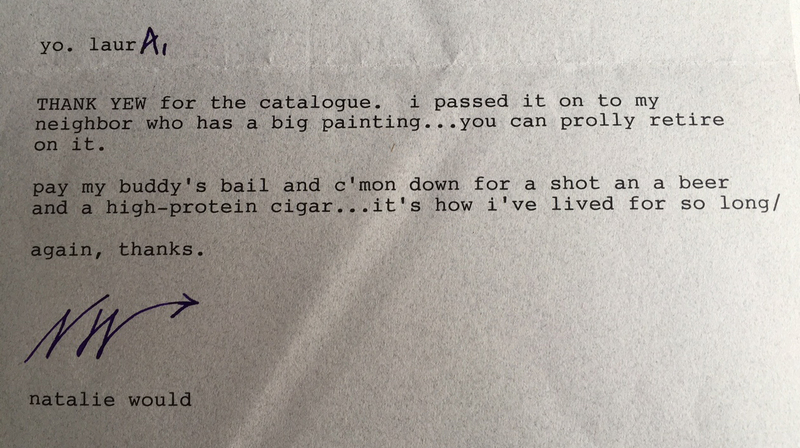 With that, I find it completely appropriate to share the last letter he ever sent me. I hope you laugh as hard as I still do. Such a nice tribute. Bob was one of my favorite professors at BGSU. He was one in a million. Like all great people, Mazur's kindness, creativity, and originality will continue to influence the many people whose lives he touched. This is so true and he has impacted many, many people! We would like to purchase the original artwork titled Lynne's Breakwall and Untitled 2014 #2. When I click on the purchase, it just shows print options. Please help!!! Hi Mike, we have word that you have been in touch with Lynne Mazur directly. Please let us know if we can be of further assistance. Laura - Because we could not get the website to acknowledge our choice to buy the the paintings noted above, we contacted Lynne to see if she could help figure out the process. We are all set to work with you. We will try the website again. A wonderful tribute to a talented artist.